The past year has left me in an almost permanent state of nostalgia. I listen to a lot of Tom Petty (still able to smell the trampled grass and spilled beer from seeing him live as a teenager), I get emotional at the drop of a hat, I look through old pictures like a war widow. I turned 29 in February and just about lost it — I couldn’t handle the idea of my 20s being over. But the real nostalgia, the real heart wringer, is for one summer on this earth in particular. I was sixteen. I wanted a job. I had no car, no driver’s license even, but I had a bike and enough desire for cash of my own that I was willing to peddle through the cicadas that June (they come every 17 years, and there they were), put on a stained blue apron, and earn my $7/hour at the cutest little French pastry shop you’ve ever seen in your life. The awning was golden yellow — that French country golden yellow — with faded script that read “Le Cezanne.” Having studied Art History my sophomore year of high school, I was more than aware of the significance of the shop’s name. The brightly painted yellow and red walls inside, not to mention the mural in the entryway, along with the checkered tablecloths and battered wooden chairs and Edith Piaf over the sound system, gave the place the most quaint, out-of-place feeling on its preppy Cincinnati street. It smelled like croissants and pastry crust and coffee. I was often assigned the early shift, opening the shop at the crack of 6 a.m., and even the ever-so-subtle hint of Pine Sol from last night’s mopping was comforting. That summer, I learned to use a cappuccino machine, to steam milk, to make crepes and simple french sandwiches with brie and ham and dijon. I learned how to properly dress a bowl of french onion soup. I learned the difference between palmier and brioche; I marveled at marzipan. I used the French I learned in school to make the experience as authentic as possible for customers. I ate thousands of leftover pastries and munched on crusty, fresh French bread all day long. I drank far too much espresso and spilled things and was hardly the perfect employee, but I felt so damn grown up that I hardly cared. Sixteen was an interesting summer at my house. My parents had separated only the year before, but — and this is a long story all its own — still managed to live right next door to one another. I was just getting used to alternating houses every two to three days with my sisters, dragging belongings back and forth. My mom was getting used to being on her own again by decorating her little house in Pottery Barn and ordering Thai takeout at every opportunity; my dad was trying to find the will to get up every morning, only to drown his sorrows every night. I knew too much about what had happened between them to ignore it. My only way out was to do just that: get on my bike and escape. My other refuge was tennis. As the only sport that had ever truly suited me, the game allowed me to spend hours outside with my peers, taking in the beach-like aroma of the clay courts, knowing all too well the feeling of too much sun on my skin, and fighting to get better at something I truly loved. Not to mention that it was on those sandy courts, underneath the shy but hazy Midwestern sun, that boys — a boy — became a big part of my little existence. He was four years my senior, a tennis phenom and graduate of my high school, back in town for the summer to teach the sport to hopeless cases like me and roam the streets of Cincinnati in his black Volkswagen like some gorgeous hippie bandit. We had known each other since my freshman year– he was simply a beautiful face and a memorable name to me then — but during my sixteenth summer, something changed. I fell in love so hard it knocked the wind out of me. I was unsure and scared and unwilling to gush my feelings to him, but when he showed up at Le Cezanne one afternoon, still sweaty in his white tennis clothes, and kissed me against the cool countertop, I was done. He’d have my heart for years after that, whether or not I admitted it to myself or to him. I stayed out as much as I could. The bakery in the morning, the courts in the afternoon, windy drives in his car with the moonroof open and Pink Floyd blasting at midnight, the leather seats sticking to my bare legs. Sure, it’s all cliche in its own way. But it was everything to me. Every time I walk into a French pastry shop (Le Cezanne closed two years after I started working there) that sixteen-year-old girl is back, if only for a moment. So when that all-too-familiar nostalgia kicked me in the pants this week, my mind traveled back to the day I met Fabrice, the pastry chef of all pastry chefs who brought the stunning sweet treats to the shop, carefully arranged them in the glass case, and left them for me to peddle to the masses, nodding, walking out with barely a word. 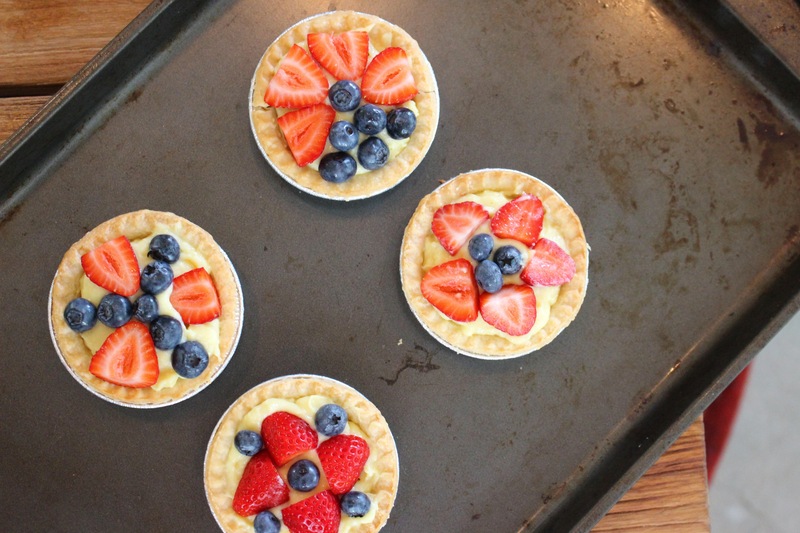 My favorite were the fresh fruit tarts, these bright bursts of color and crust and cream. I couldn’t get enough of them, and often splurged to buy them during my shifts, praying they would reach two-day-old status so that I could take them home for free. The crust was close to shortbread, buttery and sweet. 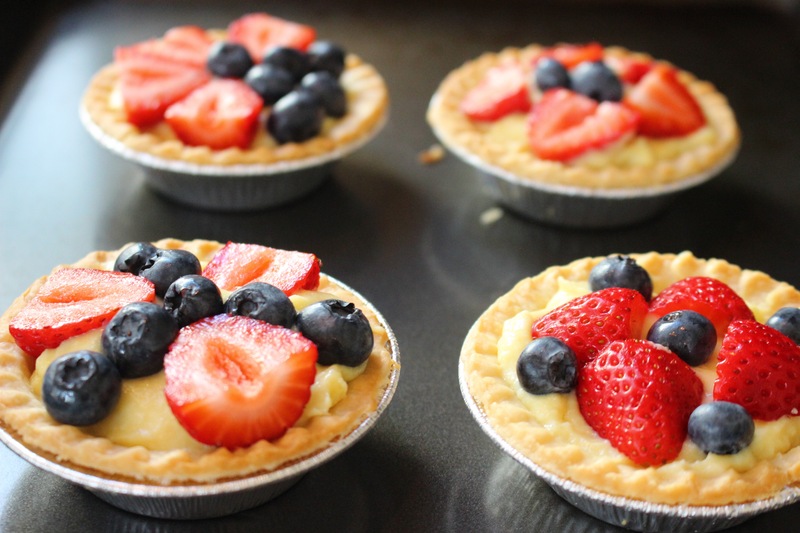 The pastry cream was perfectly smooth and just heavy enough with just enough substance to sink into the little pie crust and stay put. 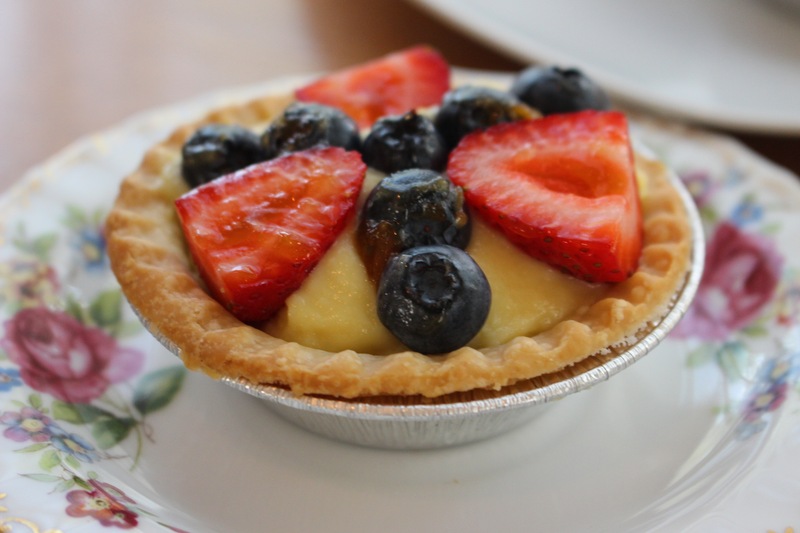 The fruits, from berries to kiwi to nectarines, were always arranged so impeccably, and jam-glazed in a way that made them glimmer in the pastry case light. I crave them constantly, still, to this day. And so, this week, I made them. 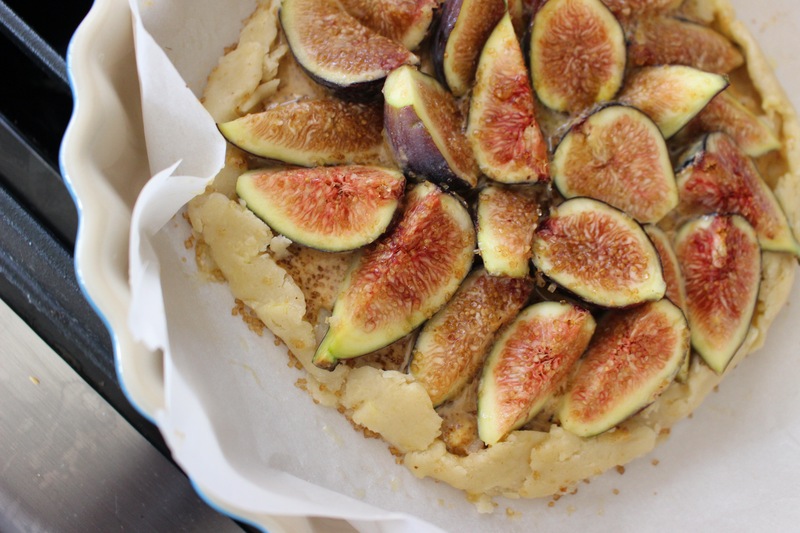 And a fig tart while I was at it. Because though French food is comfort food to everyone, it is even more so to me. Pie crusts are my Everest. I have yet to settle on a go-to recipe that will hold its shape and flake as the fork pushes through, taking the sweet juices of the fruit with it. Thousands of articles claim to have found the solution–the easiest of them all–but I’m not convinced. 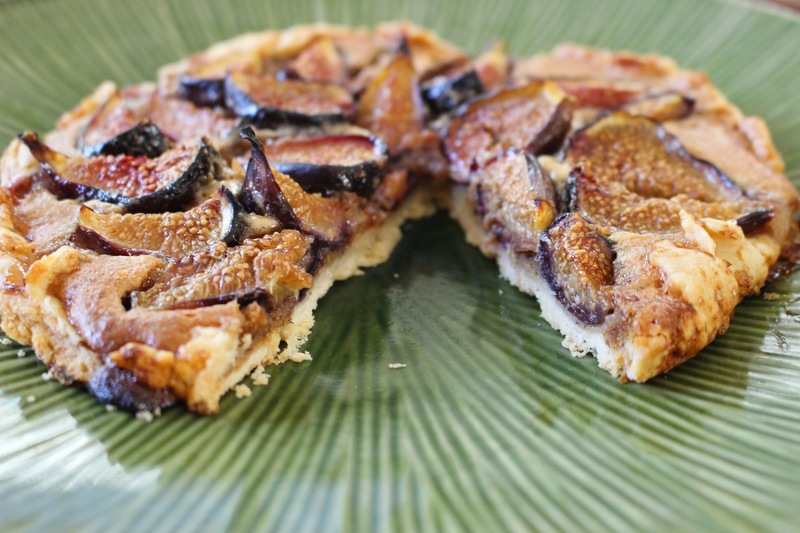 The fig tart was yet another example of this. 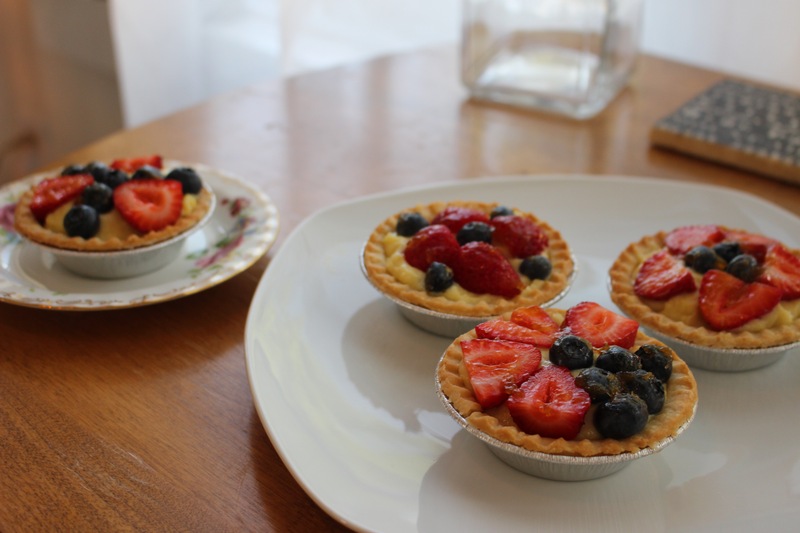 The filling, a delightfully nutty frangipane, saved it in many ways, as did a healthy douse of whipped cream at the end. So, when it came time to pour my near-perfect pastry cream into those cute little tarts of my teenage youth, I sold out. I bought the pre-made pie crusts. They are hardly worth it, but I was too impatient. I needed my salve–my figurative shoulder to cry on–and I needed it quickly. Letting the pastry cream sit for a day, covered in plastic wrap in the fridge, proved an excellent decision. It completed the cream’s texturous journey and ensured it would hold whatever I chose to place on top of it. This time, it was organic strawberries and blueberries. After this, I’ll never buy anything but organic strawberries. They are small and quaint, the brightest of reds, and incredibly sweet. 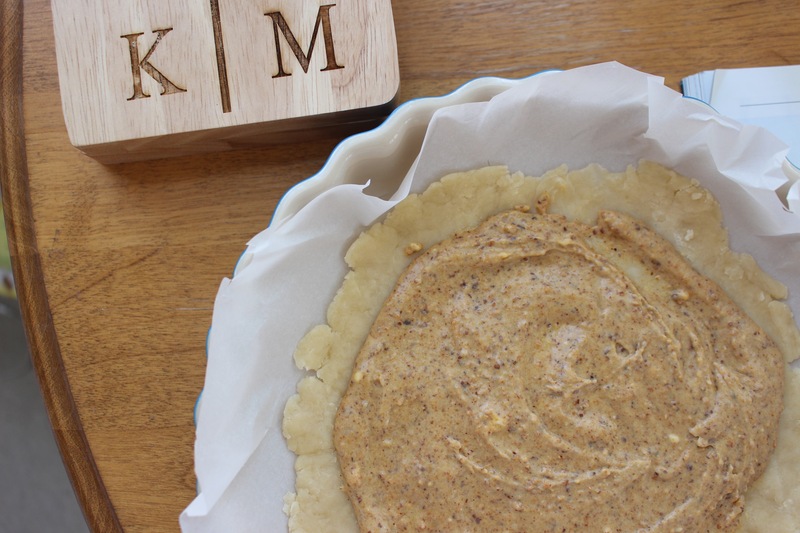 The store bought crust hardly holds the little tart together as it should, but that’s only motivation to try again, armed with yet another pie crust promise. Lord knows there will be more opportunities to day dream of simpler summer days, more glassy-eyed summer nights to ponder years gone by, and more reasons to revisit the sweetness of sixteen.